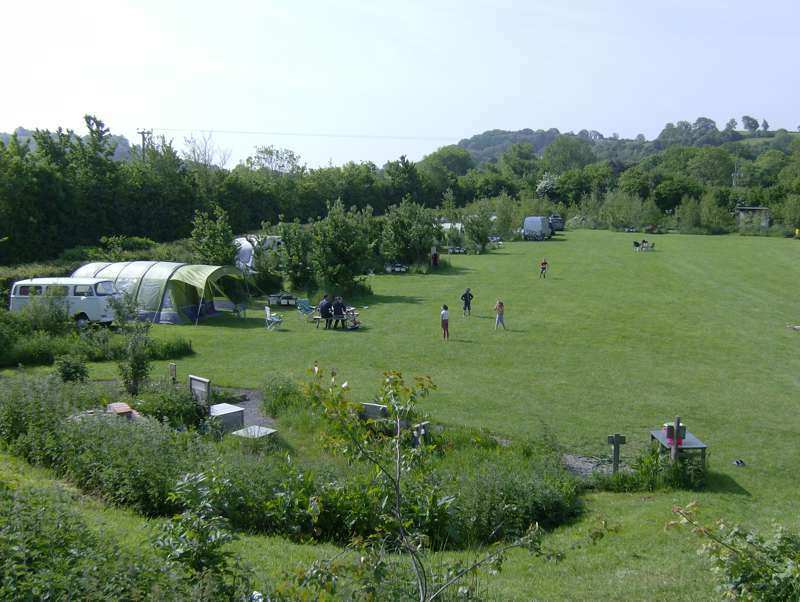 Set on the fringes of the idyllic village of Butleigh lies Orchard Farm – a tranquil spot for camping and glamping set amidst organic Somerset apple trees. This charming hideaway site manages to feel both intimate and spacious. 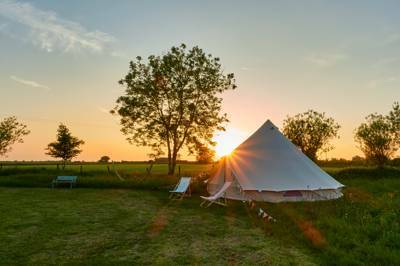 A flat, mown section of the six-acre site is allocated for just 10 camping pitches, while a trio of luxury glamping pods are situated at the heart of the orchard. A refreshingly relaxed atmosphere reigns in the orchard, with the trees providing natural plots, not to mention welcome shade in the summer. 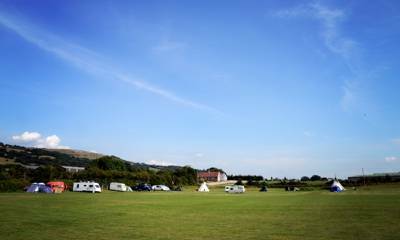 Options for both grass pitches and hardstanding’s are available, with good clean facilities for all campers. As for the three deluxe pods, these bespoke luxury structures come fully insulated with double glazing and underfloor heating (there's also a fourth pod with a toilet only). They come lovingly furnished with relaxed decor that complements the orchard’s tranquillity nicely. Each features a private en-suite with shower, kitchenette with Belfast sink, fridge with freezer box, twin zone hob, kettle and toaster, plus a dining table (a Smart TV is also provided and the pods are equipped with WiFi). Twin doors open onto a large decking area, allowing guests to the splendour of orchard life – whether rising early to enjoy your morning coffee with the dawn chorus of birdsong, or stargazing with a glass of wine as the atmospheric decking lights illuminate the surrounding trees. Late April in the orchard sees the trees in beautiful blossom and the orchard is a magnet for a variety of wildlife, (including glow worms in the warmer summer months). Besides the abundant apple trees, there is an area planted with wildflowers, while frequent visitors include woodpeckers, owls and jays. Campsite owners Kathy and Steve do their bit to help too, running a release aviary with Somerset Wildlife that sees them adopt batches of fledgling birds and help return them to the wild. It’s quite the picture of natural harmony. Leaving behind the heady scent of apple blossom on site, the local area is one of England's most vibrant destinations and demands to be explored. World-famous Glastonbury is just down the road – home to the iconic festival, it's also arguably the nation's epicentre of all things spiritual. The Chalice Well, Glastonbury Tor and the myriad spots associated with Arthurian legend are essential visits. 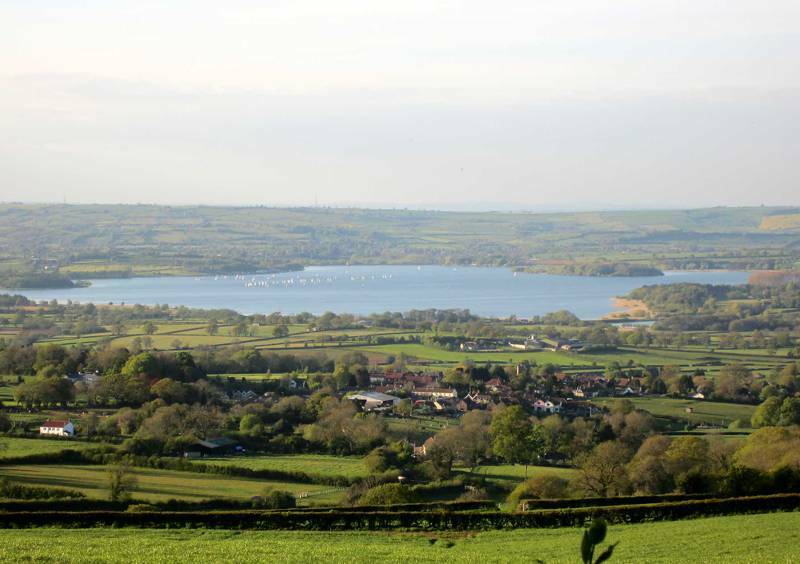 The Mendip Hills and Somerset Levels make for fantastic rambles – in fact the whole region is eminently explorable on foot, with a walking path linking to many of the surrounding villages and Coombe Hill leaving directly from the orchard. Moreover, the coastal resorts of Weston-super-Mare and Burnham-on-Sea are less than an hour's drive away. Then again, you may opt for life back at camp, enjoying a chilled glass of organic Somerset scrumpy sourced from the very same trees. How do you like them apples? For latest availability and best prices for Orchard Farm, please use the Date Search above. 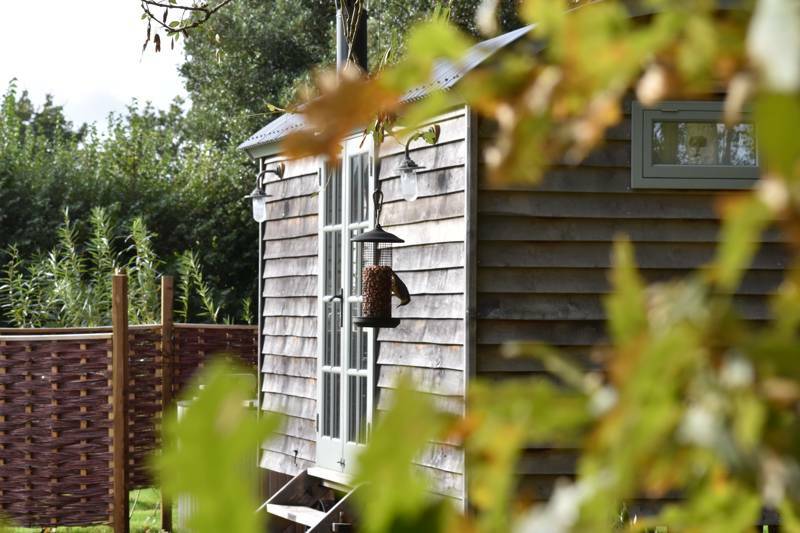 Luxury glamping pods (3 with full en-suite facilities and 1 with toilet and hand basin). 10 camping pitches (all with electric hook-ups) and 2 hardstandings. Each pod sleeps 2 on a double bed and up to 2 small children on a sofa bed. The pods have a full en-suite toilet and shower, a kitchenette with 2-ring hob, Belfast sink, fridge with ice box, kettle, toaster, cutlery and pans. A drop leaf table lifts to seat 4 inside while a 6-seater dining table is available for alfresco eating on the large decking area (with ambient lighting and a BBQ). Smart TV, free WiFi and underfloor heating all included. Pod guest have their own private parking. Campers have access to a shower, male and female toilet facilities, drinking water, a washing-up area, recycling and WiFi. There are also chemical toilet waste facilities for caravans and motorhomes. Bike hire is available on site. Glastonbury is home to a wealth of historic and mystical sites such as the iconic Glastonbury Tor, 7th-century Glastonbury Abbey (01458 832267) and the fabled Chalice Well (01458 831154). In neighbouring Wells, the Bishops Palace & Gardens (01749 988111) is well worth a visit, not to mention England's smallest city's cathedral (01749 674483). There are plenty of walks and cycle routes to enjoy throughout the Somerset Levels and Mendip Hills, or why not explore the region by the East Somerset Steam Railway (01749 880417)? The world-famous caves of Wookey Hole (01749 672243) and Cheddar Gorge (01934 742343) are a short drive away. Equine enthusiasts should seek out the free-to-visit Glenda Spooner Farm (01935 841442), a rescue and rehabilitation centre for horses. There’s an engaging visitors centre and a decent café on site. For stately homes, Lytes Cary Manor (01458 224471) and Montacute House (01935 823289) are both within easy reach. For aviation buffs, there’s the Fleet Air Museum (01935 840565) in Ilchester and Haynes Motor Museum (01963 440804) near Yeovil for petrol heads. Regular events are hosted at the Bath & West Showground (01749 822200) and Longleat Safari Park (01985 844400) offers a fantastic family day out. For some retails therapy, Clarks Village Shopping Outlet (01458 840064) is 4 miles away in Street. Just 400m from site, the village pub is The Rose & Portcullis (01458 850287) – a traditional CAMRA-approved tavern with flagstone floors and a fireplace warming punters in the winter months. A mile and a half away at Barton St David you'll find The Barton Inn (01458 850022) – a cracking community pub that hosts live music and comedy nights and an excellent fish and chip van that stops twice weekly. In Butleigh, The Drawing Room (01458 851093) tearoom makes for a lovely pit-stop on your walk or after picking up a paper from the village shop. Glastonbury and Street (both 4 miles away) boast a wealth of places to eat and drink. For special occasions, there are some fine dining establishments within 5 miles – just ask your hosts for recommendations. Pods are open all year. Camping is available April–October. Glamping starts from £78 per night. 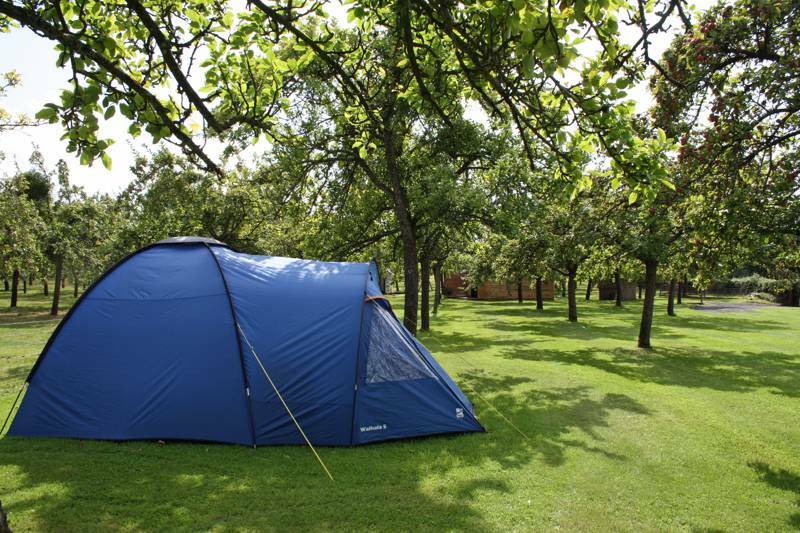 Camping from £16 per night. Type 'Orchard Farm Campsite' into Google Maps for best results. From the A303 at Podimore roundabout, take the A372 towards Langport. After ¼ mile take first right showing brown sign to Lytes Cary (NT) and Charlton Mackrell. Follow this road for 3¼ miles, passing through Charlton Mackrell to a T-Junction with the B3153. Turn right and then immediately left. After ½ mile take the second right signposted to Butleigh. Travel for 1¾ miles, going 200m past the memorial, then taking the next right. The site entrance is 100m down this road on the right. From the A39 Glastonbury/Street take the B3151 towards Somerton. After ½ mile, at the traffic lights, turn left towards Butleigh. Travel on this road for 3 miles, through Butleigh Village, taking a left turn on Barton Road at the Rose and Portcullis Pub. After ¼ mile, take the first right signposted to Kingweston. The site is 300m on the left. Castle Cary is the nearest train station (25 mins drive away). A local bus service operates from the Rose and Portcullis Pub and village shop. Several local taxi firms cover the area.